The Sibling is an analog OTA (Operational Transconductance Amplifier) phase & ring modulator. Little sister to the Whetstone Phaser, the Sibling shares a lot of the same DNA but with a stripped-down-to-the-bones attitude and a more streamlined format. In Slow Mode you’ll find the classic, slow phaser sweeps. In comparison to the Whetstone, Slow mode on the Sibling goes slower than Normal mode on the Whetstone, but not quite as slow as the slowest sweeps in the Whetstone’s Pads mode. While in Fast Mode you’ll find the faster throbs, wobbles and ring modulator effects. In comparison to the Whetstone, Fast mode on the Sibling is identical in speed range with Ring mode on the Whetstone. 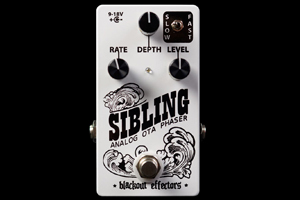 Unlike many phasers the Sibling’s Level control allows you to perfectly match unity gain with the rest of your pedal chain or dial in just the right amount of signal boost to make your phased tones grab everyone’s attention.